The East Cape of South Africa has been a premiere safari destination for many years. A primary reason for that is the area has 5 of Africa’s 7 known biomes ( bio-geographic regions) –all in this one province! That means a tremendous habitat diversity, which translates into highly varied geography and plant life, and a huge variety of animals and birds. 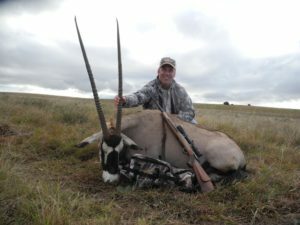 This Professional Hunter, besides his own ground– hunts 80 other concessions totaling hundreds of thousands of acres, virtually guaranteeing that you will find every specie of plains game your heart desires! In addition the area has much scenic beauty and many parks and other things to see and enjoy. It is a wonderful safari destination. So you have a great area, a great diversity of game and terrain—and we have secured you some incredible pricing on top of that!! The list of species is awesome! You will stay at this safari-style Guest Lodge. 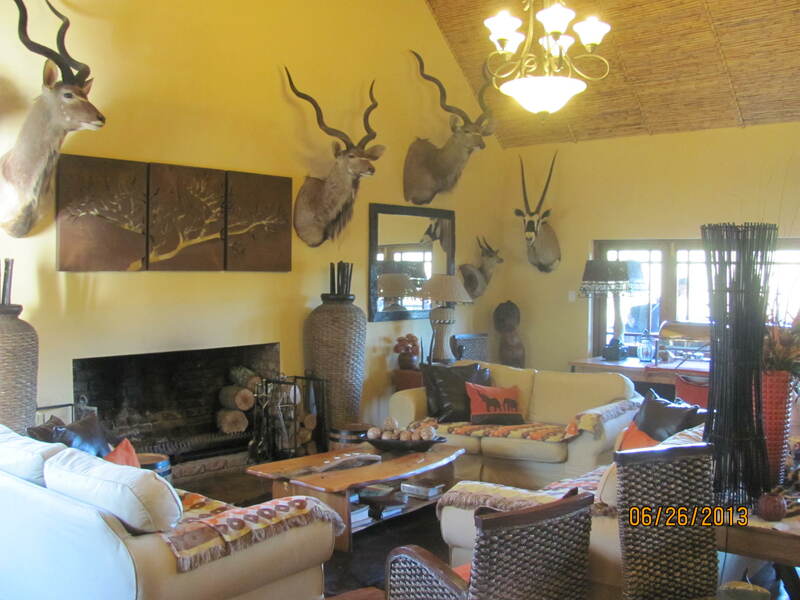 The Lodge is situated on a private game reserve which boasts over 17 species of wild game animals roaming around the lodge, including Kudu, Giraffe, Impala, Nyala, Bushbuck, Waterbuck, Duiker, Grysbuck, Springbuck, Warthog, Bush pig, Mongoose, Jackal, Meerkat, Lynx and primates. Sip cocktails at the evening fire while watching a giraffe across the valley or for the other local critters to show up! We took great enjoyment over watching the giraffes across the valley- looking like pre-historic dinosaurs, towering over the trees! We’ll drink to that anytime! And plenty to see and do for non-hunters. 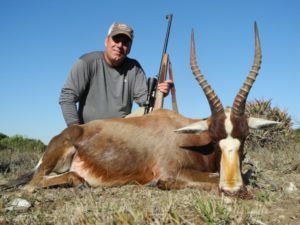 They can arrange a great time visiting game preserves; or do a visit to the Addo Elephant Park and to the resort towns of Jeffries Bay and Knysna. 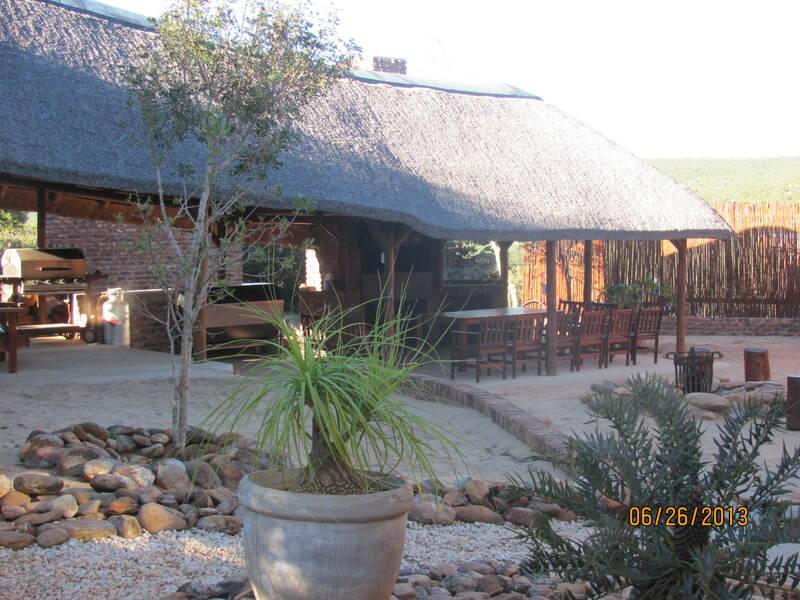 The lodge is close renowned reserves like Addo Elephant National Park, the world famous Shamwari Game Reserve, a Cheetah Breeding farm, and Elephant Back Safaris and the oldest Private Lion Game Reserve in the area. Lots to see and do. We (Butch and Joan and their clients) did the cheetah farm (Joan had a full grown female napping in her lap! ), saw Chuck and Norris the lions! Addo Elephant park is huge, hundreds of thousands of acres, full of every animal including most of the big 5. We had elephants 5 feet from the car! Sundays are a favorite to take a day off hunting (some concession owners do not like Sunday hunting). We had a truly awesome day taking photos of all the calm game at point blank ranges – like elephant at literally 20 feet! 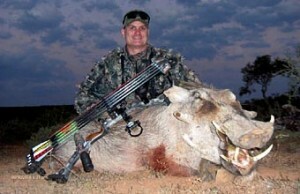 He gun hunts many tens of thousands of acres, and does as much bow hunting as he does gun hunting! He now has 6 bow hunting areas of 38,000 acres– where he allows ONLY bow hunting. They had about 91 bow hunting clients in 2007 taking 411 animals!! That is a great average of nearly 5 animals per hunter!! They have pit blinds at water holes and their vegetation is excellent for walk & stalk hunts. Either blind or walking will work. Tree stands because of the vegetation are not used. This outfit knows bow hunting!!! And they handle just as many rifle hunters, if not more! He also has access to an incredible variety of entertainment. Elephant rides; game parks, theme parks, shopping centers the list is long-just ask us! Great for non-hunters!! 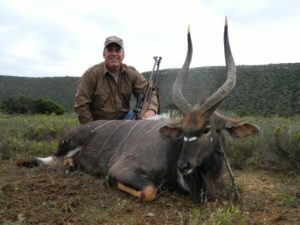 Hunting usually starts with an early breakfast (usually light) and then into the safari vehicles. You will drive in the vehicles spotting for game or tracks. You will get out to glass and do stalks. Or you may walk and stalk if that is a preference- but most success comes from using the vehicles to cover lots of ground. You are led on a stalk by a tracker and a PH- so you are normally 3rd in line. Practice shooting standing off of sticks- very important! Most shots are done that way. Lunch can be a major or minor affair, then hunt all day and a big dinner late, usually around the fire (lapa). Stories flow around the campfire! He has a fully stocked bar and evenings ended up by the fire with a drink in hand. Great stories and lies were told!! NOTICE: Alcoholic beverages are not included! We can arrange for liquor, but you must tell us. DELIVERY CHARGE: If you want your trophies delivered to the taxidermist for dipping, packing etc- you must pay an $80 delivery charge for each client’s animals. NOTICE: The policy here is if you don’t see the animal or you don’t shoot one — then you don’t pay for it and you will be credited back the “package value” for the animal. His PH’s are good and will always tell you beforehand the size of the animal. Package value is always discounted, so do not apply the full trophy fee- usually about 70 to 80% of it is the Package value.  VAT of 14 % is only levied on our daily rates and services. 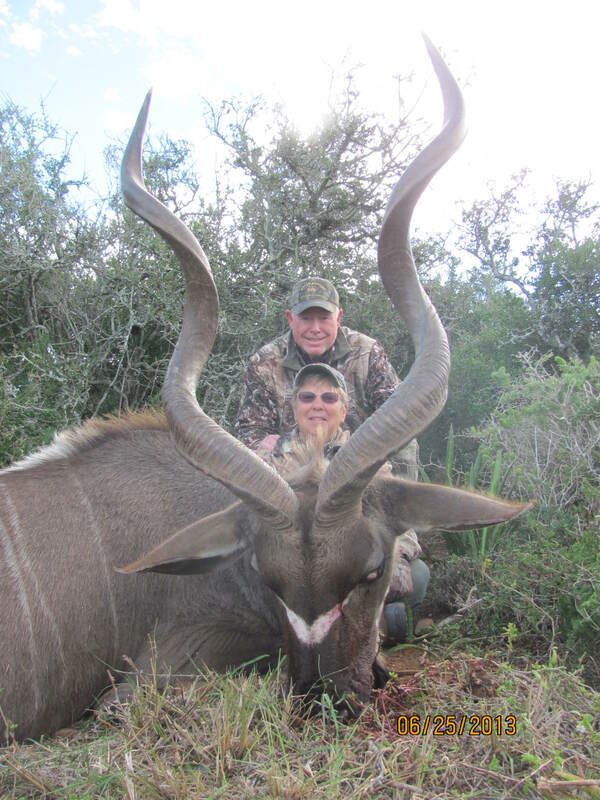  No VAT is payable on animals hunted.  If you purchase goods for more than R250.00, keep your receipts, as VAT payments will be refunded for these items at any of the international airports in South Africa prior to your departure.  Cancellation: Less than 6 months before arrival date – no refunds will be made, unless re-booked for any period within the next twelve months. More than 6 months before arrival date – 50% of the deposit will be refunded.  Balance of hunting package payable on arrival.  All payments must be made in either cash, traveler’s cheques. NO MONEY ORDERS please. Trophy fees are payable in respect of all animals bagged or wounded. All luggage, domestic and international, is now being screened in South African airports. Screeners are finding ammunition in checked bags that is incorrectly packed and are forcing passengers to remove it from their bags, which is causing all kinds of havoc. All ammunition must now be packed and transported in a lockable ammo box placed within your checked luggage (NOT the rifle case!). A manufacturer’s carton is no longer sufficient. Remember that there is also a limit of five kilograms of ammo per passenger. That includes the weight of your ammo box. And don’t forget to declare your ammo at check-in. We strongly recommend that ammunition be packed in lockable cases, which can be handed in as loose items at the firearm counters to avoid possible delays during checked baggage screening. Butch and staff will help you arrange for gun permits and processing assistance. The gun import process is best handled by one of several services who do that- costs average around $100-$120. Must be arranged for well in advance! 2. 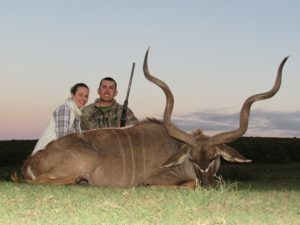 1 day safari to a Lion reserve which include a night drive looking at 35 species of animals and Lions hunting & feeding. This is a must do. $150 per person. 3. 1 day Safari to the cheetah ranch where they can touch wild Cheetahs and handle baby Cheetah cubs and Lion cubs. This is a must for the kids. $70 per person. 5. 1 day tree Top Tour. Enjoy the unequalled experience of traveling 30 meters above the forest floor through the tree top forest canopy gliding along on a steel cable. A view once only seen by the many exotic birds of the indigenous forest. At each platform spend a few minutes relaxing as your guide enthusiastically explains the ecology of the forest around you. Pointing out magnificent giant ferns and the many different exotic trees. About three hours later you emerge from the forest having undertaken a rare journey of a life time. An unusual experience which will never be forgotten! $150 per person. 6. 1 day Bungee jumping – Bloukranz Bridge is in the Guinness Book of Records as the highest bungi jump in the world at 216 meters. Even if it is not for you, it is well worth holding your breath and watching others take the plunge! The free fall takes 5 seconds, the stretching of the bungi rope takes another 2 seconds. The first rebound is higher than the Victoria Falls Bridge jump and the second rebound is higher then the Gouritz Bridge, which is 65 meters. Your body accelerates to around 120mph before decelerating – Awesome stuff!! – Day trip $190 per person. • 1 day scenic tour down the garden route going as far as Knysna. For the family $190. This trip we can combine with a visit to Oudtshoorn where we can visit the biggest Ostrich farm or the world renowned Kango caves. For the family $198.